VATICAN - The "revolution" of Missionary Childhood: for 175 years "children help children"
Vatican City (Agenzia Fides) - "A new style of mission is born with the Missionary Childhood Society that focuses on the grace of baptism, from which springs the missionary nature of every Christian, and also recognizes the right of children to receive it and the duty to give it. For the first time in the Church, children have become active subjects of evangelization, protagonists of pastoral care, in their simplicity and humility. For 175 years this Society, also called Missionary Childhood, fulfills the mission of saving children with children". 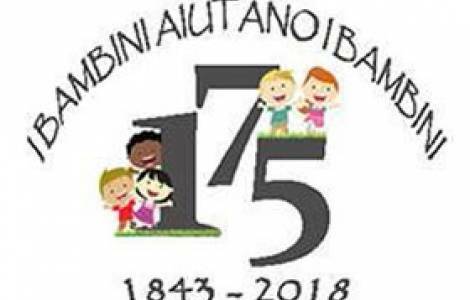 With these words Sister Roberta Tremarelli, AMSS, Secretary General of the Pontifical Childhood Missionary Society, explains to Agenzia Fides the particularity and novelty brought by this Society in the field of missionary animation and pastoral care of children, on the occasion of the 175th anniversary anniversary of itsfoundation. On May 19, 1843, the Society of the Holy Childhood was officially born, and the will of the founder, Monsignor Charles de Forbin Janson is expressed in its name: to entrust it to the protection of the Child Jesus. Born in Paris in 1785, from an illustrious and Catholic family, Charles de Forbin Janson attended the Chapel of the Institute of Foreign Missions in Paris during the Seminary, thus entering in contact with the missionaries. He listened to the stories of their work in China and to the thousands of children whom priests and nuns welcomed, looked after, educated, baptized. His missionary spirit is further strengthened after his priestly ordination. At the age of 38 he was ordained Bishop of Nancy and immediately began to organize retreats and missions in all the parishes of his diocese. He generously distributed his family wealth and only kept what was necessary for himself. During his absence from the diocese for pastoral commitments, the anticlerical looted the episcopal seminary and prevented him from returning to Nancy. This is when the sad period of exile began during which, however, he continued to think about the missionaries and children of China. After three years of mission in North America, he returned to France and, in Lyon he met Pauline Jaricot, the founder of the Society of the Propagation of the Faith. What she had organized for adults in France, he organized for the children in France and the whole of Europe. The children helped their brothers and sisters, not just those of China but of all the missions of the world, with a short daily prayer and a small monthly sacrifice. "The Society awakened European children to the needs of other children, with a new dimension of missionary awareness: to transmit a gaze and missionary heart since childhood", emphasizes the Secretary General of Missionary Childhood, who continues: Today the Society has taken root in more than 150 countries. Through the International Secretariat, which has its headquarters at Propaganda Fide, in Rome, the offers collected in every part of the world support thousands of solidarity projects that help the children of the 5 continents with the aim of providing them with necessary tools to be able to live life in a dignified way, both physical and spiritual. The areas of commitment are: Christian and missionary animation and formation, infancy, pre-school and school education pastoral care, protection of life". The Society is helping about 20 million children in the world. In 2017, 2,834 projects were funded for a total of 17,431,260 dollars, through the Universal Solidarity Fund consisting of offers from children all over the world. Each type of funded project can and must be an opportunity and a tool for missionary animation.